OK, let's put more holes in the base! 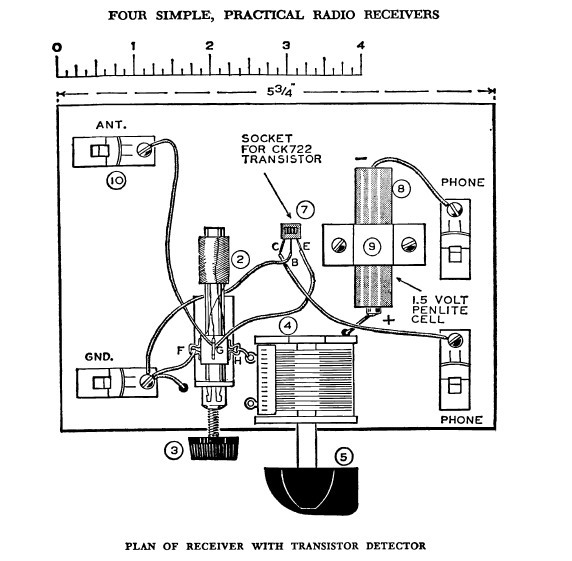 Further on in "The Boys' Third Book of Radio and Electronics" is this receiver. It was off to Ree Electronics for a coil and a transistor. They didn't have a CK722. 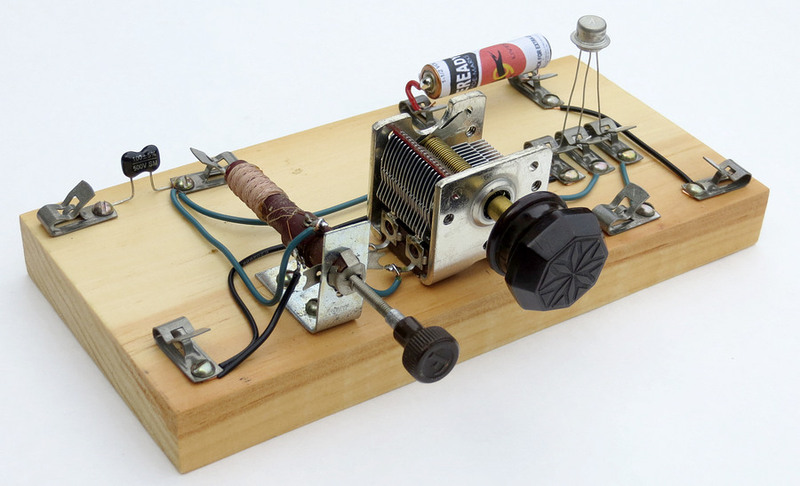 The CK722 was designed for hobbyists and Ree was an electronics retail and repair outfit. You wouldn't find a CK722 in any piece of consumer electronics. They sold me a Germanium equivalent. By the way, the CK722 became the most popular transistor in the world, but inside every one was a REJECT from the hearing aid industry. In the early 1950s Raytheon was producing tens of thousands of transistors a month, but only half of them met specifications. 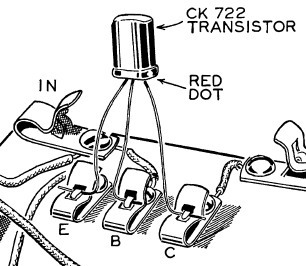 If the rejects worked up to a certain point for gain and noise, they were repackaged as a CK722. I didn't have a socket, so the transistor would be mounted like this. I realized that by adding three Fahnestock clips for the transistor, I wouldn't have to move any of the others. The diode connections could become the battery connections. Antenna, ground and phone connections could all remain the same. The set was wired according to this drawing. This is important later in the story. Here is the recreation. The transistor is a CK722 / NTE102 Germanium equivalent. The battery is an AAA skinned with a printed vintage wrapper. I am quite impressed with this. 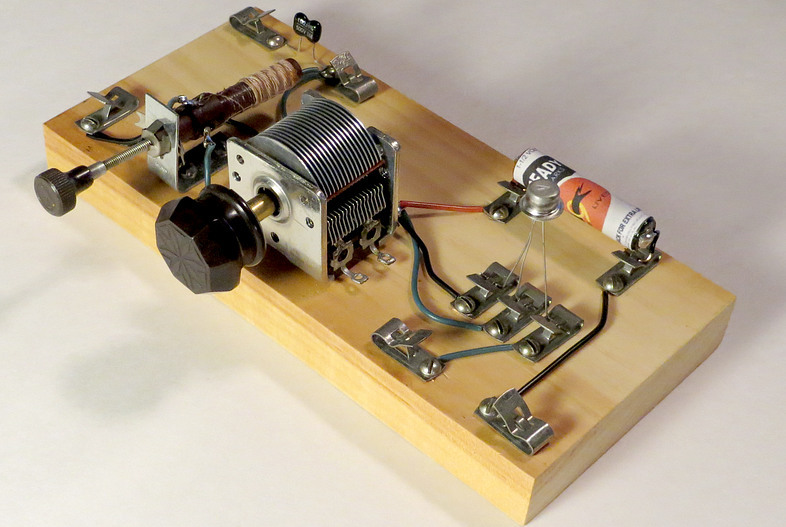 This radio has ONE active component and a battery. The selectivity is very good and our local station, WNPV 1440 AM, came in with plenty of volume. If this radio works so well, why are there so many other holes in the old base? before you read on, so that the violin is playing. In spite of my efforts in 1966, the radio didn't work. Why didn't it work? I didn't have an actual CK722 transistor, so maybe those guys at Ree Electronics sold me the wrong part. And you probably need that socket. The socket must have something in it that makes the radio work. In other words, I didn't build it EXACTLY like the drawing, so it didn't work. Also, notice in the drawings that one of the connections going to ground ends in a black dot. I don't know why Morgan drew it this way. I think the wire goes under the base and comes back up behind the variable capacitor. So maybe it didn't work because of that. Maybe the wire had to be under the base for the radio to work. Actually, there is a MISTAKE in both drawings. The red dot in the top picture is supposed to be on the Collector, not the Emitter. 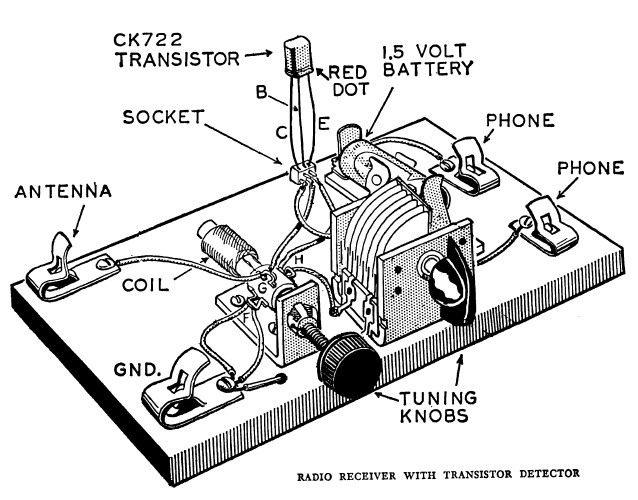 The Base and Emitter connections are swapped in the other drawing. The schematic is correct. 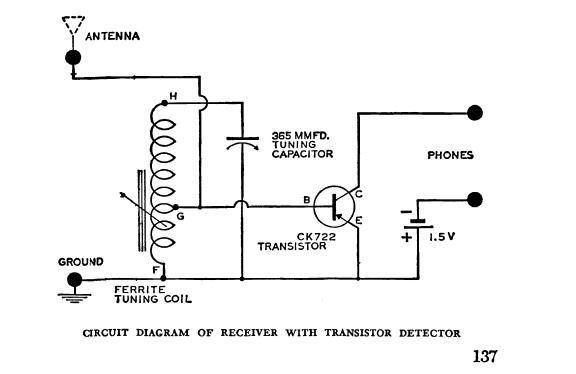 I may have fixed the radio by reading the text and looking at the schematic, but I don't remember. It wouldn't have made any difference at the time. The main reason the radio didn't work was because no current flows through the transistor until you plug in the headphones. The headphones complete the circuit, and are the on/off switch. I didn't have headphones. I had a crystal earplug. The crystal earplug didn't conduct direct current through it, so the set was never "on". It may have worked perfectly but I never knew it. I could have dropped a 2.2K resistor across the headphone clips, but I didn't know that. My sole source of radio knowledge came from the Alfred P. Morgan books. So apparently the set was partially dismantled and used for other radio experiments. I still have the transistor I got from Ree Electronics. I plugged it into the set, and it still works. It is so beat up that I didn't use it for the picture. That music is so sad. Is that violin music still playing? On the next page are two more crystal sets that didn't work at first.